Are you looking for a quick and easy way to integrate forms into your website? Then I would like to introduce you to one of the most popular contact form plugins for WordPress. There are a lot of different plugins for creating contact forms. What's so special about this one? WPForms offers a unique drag and drop editor and a comprehensive feature set that lets you give your forms that special something. 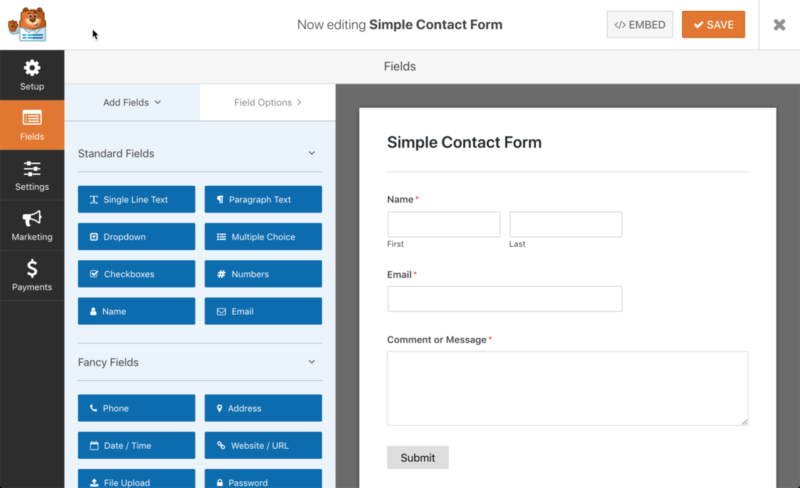 WPForms is by far one of the best and most popular contact form plugins for WordPress. It has over a million active installations and 4.9 of 5 stars at nearly 3,800 ratings. A big advantage of WPForms: easy handling. Forms can be easily integrated into your own website. All you need to do is download and install the WPForms plugin. For those who just want to test the plugin first, there is, of course, a free version available. If you have WPForms installed in WordPress, you can start creating your first form right away. For this purpose, the plugin offers you ready-made templates, which you only have to adapt to your wishes. The WPForms forms are all output in the Responsive Design. This means they adapt to all end devices (desktop PC, smartphone, tablet). This is - even in today's world - not yet a matter of course for such a plugin. If you want to create more than just a simple form for your website, the Basic, Plus, Pro and Elite packages provide you with more useful features for order. The functions of WPForms With the Drag & Drop Form Builder, even complex forms can be created with just a few clicks. So you need neither experience nor programming skills to create your first Responsive form. In addition to the creation of forms, WPForms offers its users numerous functions that can be integrated into a form. No matter which variant of WPForms you choose, the ease of use remains the same. 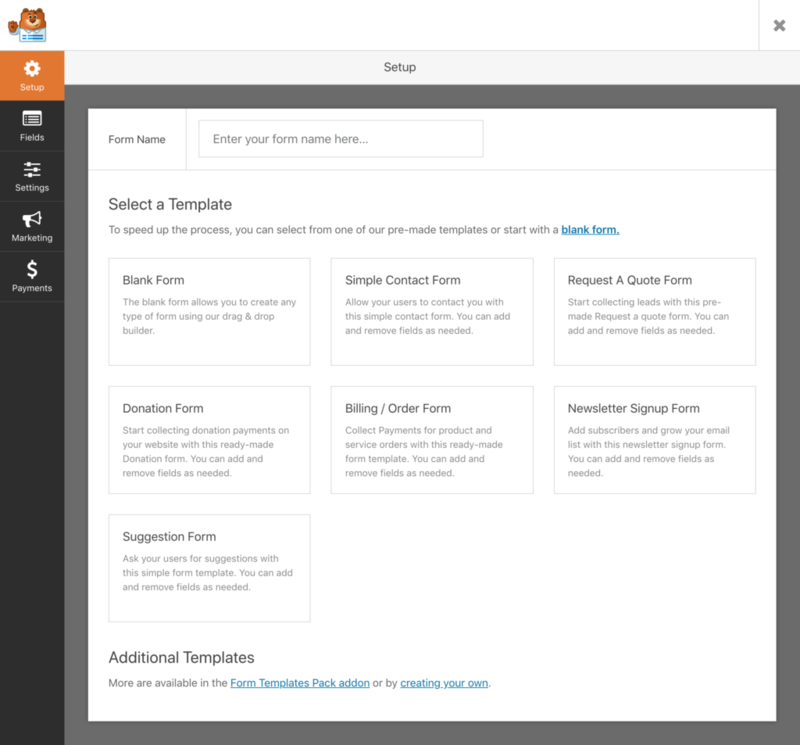 Even with the free version you can easily create forms and embed them on your website. However, the premium versions offer you additional and useful features: Additional templates, add-ons or functions such as marketing tools and integrated payment providers. You can download the WPForms plugin for creating forms in the free version from the WordPress plugin directory or install and activate it directly via the WordPress backend. In the free version, a total of 3 templates are available. This includes the template "Empty Form", "Simple Form" and the "Suggestion Form". You can use all three templates in the free version and adapt them to your needs in the editor. However, you will notice that only a limited number of options are displayed in the "Fields" menu (free version). Likewise, the "Marketing" and "Payments" menus can only be used in one of the premium versions. Only from the Basic version onwards can you extend WPForms using add-ons. 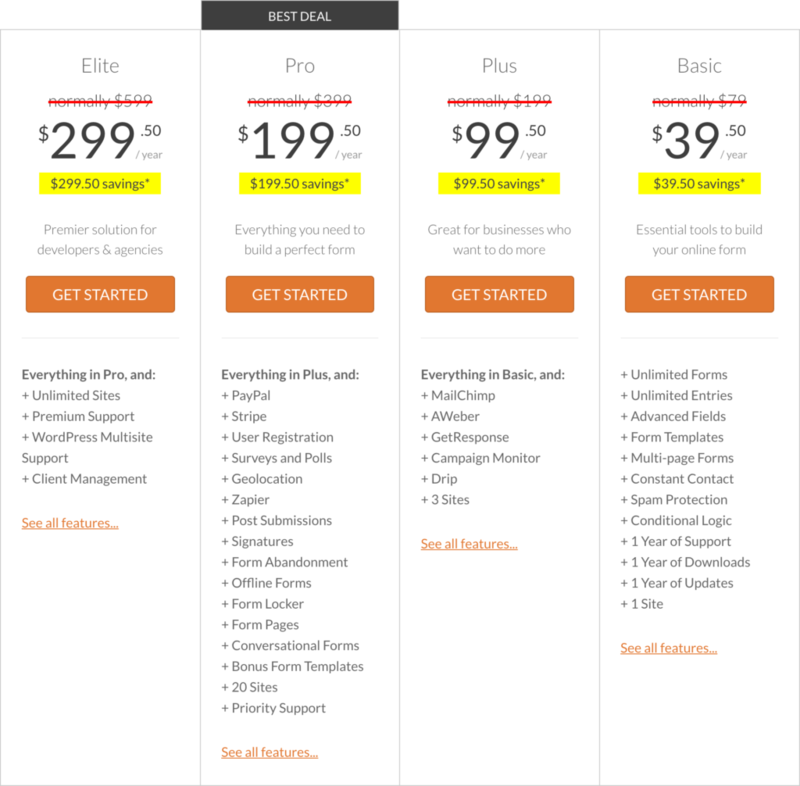 The premium versions of WPForms are divided into different price plans. Thus each of the available versions (Basic, Plus, Pro and Elite) offers further functions which are not available in the previous version. I would like to briefly discuss two special premium features. Beginning with the Basic version, the so-called "Conditionals" are available to you as a user of WPForms. These allow you to customize the behavior of the form to each individual user. This means: If a user performs action A, the fields B and C are displayed. If a user performs action B, the fields C and D are displayed. 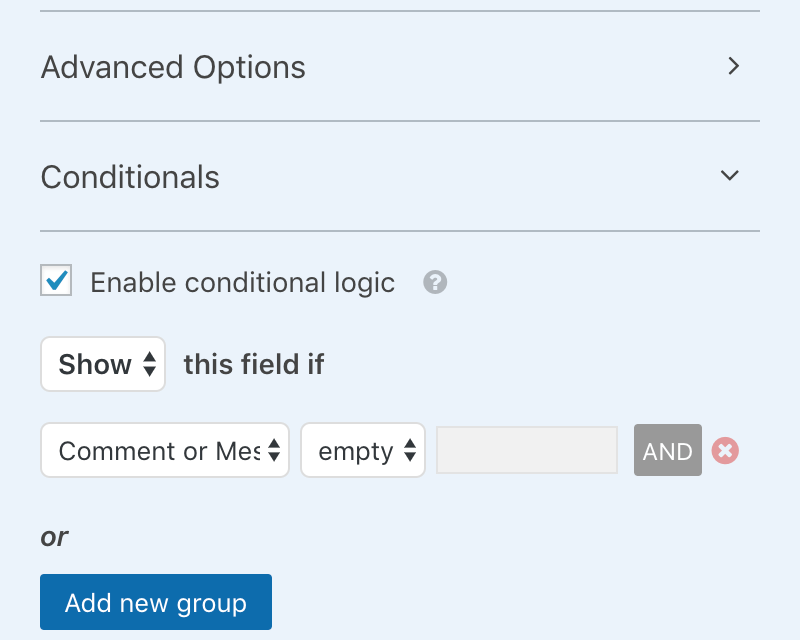 You can use the conditions to determine which fields should be shown and hidden in the form - depending on the user's action. This add-on allows you to create survey forms with multiple fields, view them using statistics, and share the result within the form with your users. To create a survey, you can choose from a variety of survey functions. So your surveys can consist of pure text, a drop-down list, checkboxes, ratings, a Likert scale or a net promoter score. After completing a survey, you can also create, save or print extensive survey reports. For whom is a premium version worthwhile? The premium version of WPForms is suitable for all those who want more than to integrate a simple contact form on their website. With the premium versions, you can get more out of the integrated forms, whether you want to do real marketing or get to know the user and offer him more than just positive user experience. As a premium user, you also have access to spam protection, geodata, a campaign monitor, file uploads and much more. For even more "automation", you can also connect the Zapier tool. WPForms currently offers its users a total of 4 premium versions. This includes the versions: Basic, Plus, Pro and Elite. The basic version for $39.50 is the entry-level model for a website, with unlimited forms, conditional logic, and spam protection. If you need further functions like marketing tools (AWeber, MailChimp etc. ), payment providers (Paypal, Stripe), you should take a closer look at the next higher premium versions. You can cancel your subscription at any time after purchase. You will still be able to use all functions of your purchased version. With the subscription, it is only guaranteed that you will be able to subscribe to the newsletter within your subscription period. updates for the contact form plugin. With the WPForms plugin, you can create user-friendly and professional forms in WordPress. For all those who simply want to embed a simple form on their website, the free version is completely sufficient. If you want to use further functions, you need one of the 4 premium versions with costs. WPForms® is a registered trademark of WPForms, LLC.